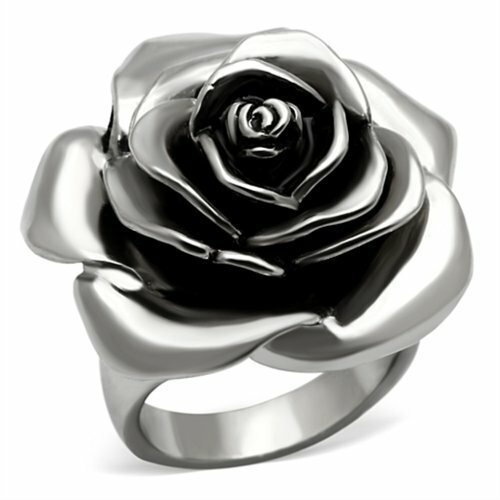 Have yourself an accessory to pair with any style, on any occasion-the elegant Stainless Steel Black Epoxy Rose Design High-Polished Ring ! Crafted with a blend of class and style that makes this item an eye-catching accessory, this stunning accessory features an exquisite and charming rose mold design. This stunning centerpiece is also combined with a delicately designed and highly-polished Tusk 316 stainless steel band that does not stain, corrode, or rust easily; a material known for creating the highest quality of jewelry. 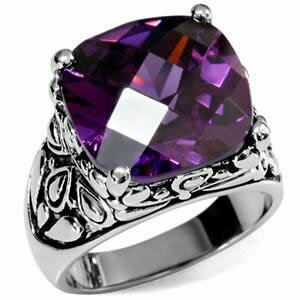 Add that sophisticated and classy detail to your style with the Women's Stainless Steel Black Epoxy Rose Design High-Polished Ring. Available in sizes five to ten for you to choose from! Gorgeous princess ring with sophisticated detail. 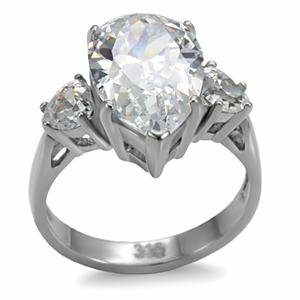 Crafted from the finest stainless steel and featuring a prince cut cubic zirconia surrounded by four more equally stunning stones. Pairs perfectly for a night out with your love! Stainless steel two tone ip rose gold and silver bypassing cocktail ring. Add a touch of elegance to your everyday fashion with this Stainless Steel Clear Blue Round Cubic Zirconia Stone High-Polished Ring ! Crafted with a blend of class and style that makes this item an eye-catching accessory, this stunning ring features a quaint and unique clear blue cubic Zirconia stone. This stunning centerpiece is also combined with a delicately designed and highly-polished Tusk 316 stainless steel band that does not stain, corrode, or rust easily; a material known for creating the highest quality of jewelry. Give your style an added sophisticated look, perfect for any occasion. 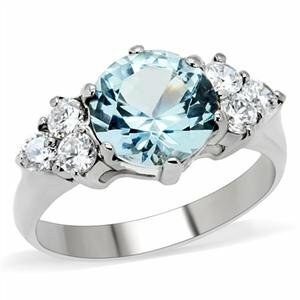 The Women's Stainless Steel Clear Blue Cubic Zirconia Stone High Polished Ring is available in sizes five to ten for you to choose from. This stainless steel 9 ct. pear cut cubic zirconia stone is coupled with two smaller heart shaped cz stone on either side. Stainless steel jewelry is durable and does not tarnish. Not only is stainless steel one of the strongest metals, it also does not oxidize. 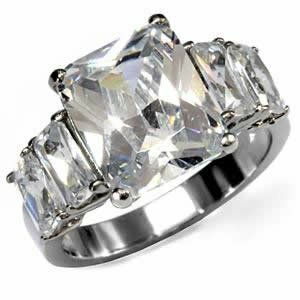 Stainless steel jewelry can be easily cleaned with warm water and a clean cloth, thus forgoing purchasing expensive jewelry cleaners. In addition, those who are allergic to nickel can wear stainless steel jewelry as it is a hypo-allergenic product. All stainless steel rings are stamped with 316 on the inside of the band. A novelty belt buckle ring with clear crystal stones. Stainless steel tusk. 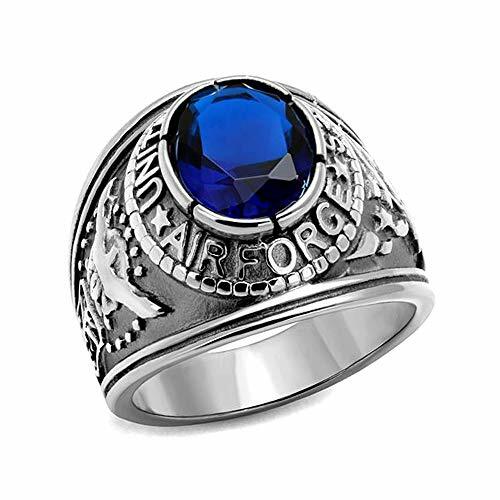 The Men's Stainless Steel United States Air Force Ring is manufactured to precision, carrying the standards of a high-quality jewelry. Made to accentuate the look of every wearer with a timeless and statement-setting design. Add a touch of an elegant charm to your casual look with this accessory. Featuring a premium-grade Stainless Steel; an alloy with a minimum of 10% chromium content by mass so it doesn't stain, corrode, and rust easily like normal steel. 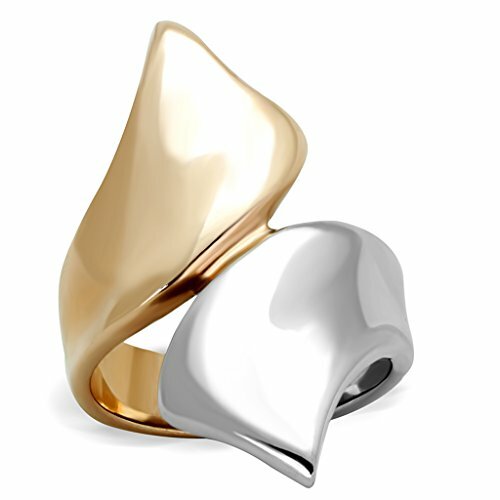 The ring is exquisitely made to be hypoallergenic, so it won't cause any irritations or allergic reactions. Thus, it is extensively used in heavy gauge-welded components, such as jewelry. Tusk 316 stainless steel is one of the highest qualities for jewelry products. Exude masculinity and make your ensemble count, this staple jewelry piece features a delicately engraved 'United States Air Force' text topped with a synthetic Sapphire stone placed at the center, giving it a hint of crystal look. Wear it alone for a more sophisticated style or mix and match with your favorite accessories. The Men's Stainless Steel United States Air Force Ring is available in sizes eight to thirteen to let you find one that perfectly fits you. 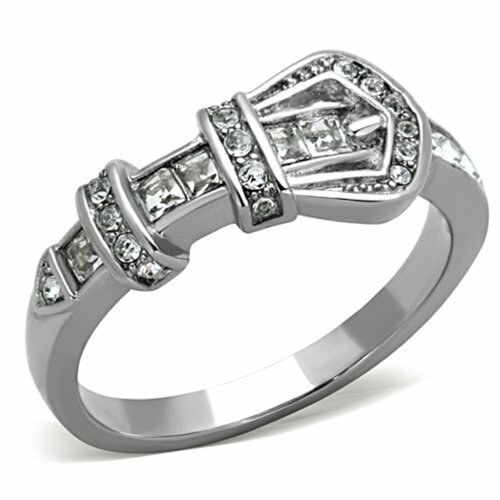 Wear this classy and luxurious ring that is crafted into perfection. 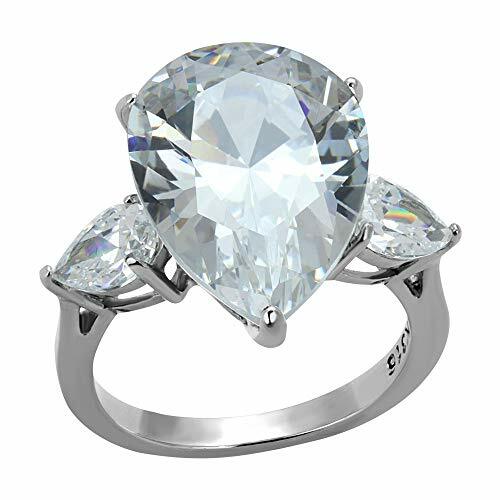 This perfect ring has a large genuine Clear pear cubic zirconia center stone accented with smaller pear shaped side stones. This ring will last for years constructed with stainless steel tusk.Perfect for cocktail parties, this ring will be adorned by many. Shopping Results for "Eternal Sparkles Jewelry"